The Queensland State Junior Surfing Titles is the premier junior series that determines the “best of the best” to compete at the Australian Junior Surfing Titles in 2011. Teenagers from across the state will enter their age divisions to compete for a spot in the Queensland Junior Surfing Team. Ideally, this year’s Titles are held on the beautiful Sunshine Coast, home to more than 100km of beaches stretching through the coastal towns of Caloundra, Kawana, Mooloolaba, Maroochydore, Coolum Beach and Noosa. 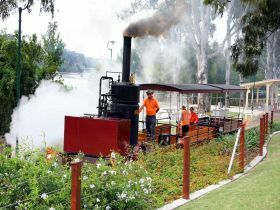 Step back in time at Gympie's Ultimate Steam Festiva, from 22 - 24 July, where the three heritage attractions (Gympie Gold Mining and Historical Museum, The Mary Valley Heritage Railway and Woodworks Museum) will combine forces to present a unique and educational experience not just for steam buffs, but for all people young and old to experience the various uses of steam. Some of the highlights of the festival are steam train rides, vintage bus rides, steam demonstrations and historical displays, wood chopping and carving, live entertainment, food and refreshments, camp oven dinner, children's rides and activities, vehicle displays and more.